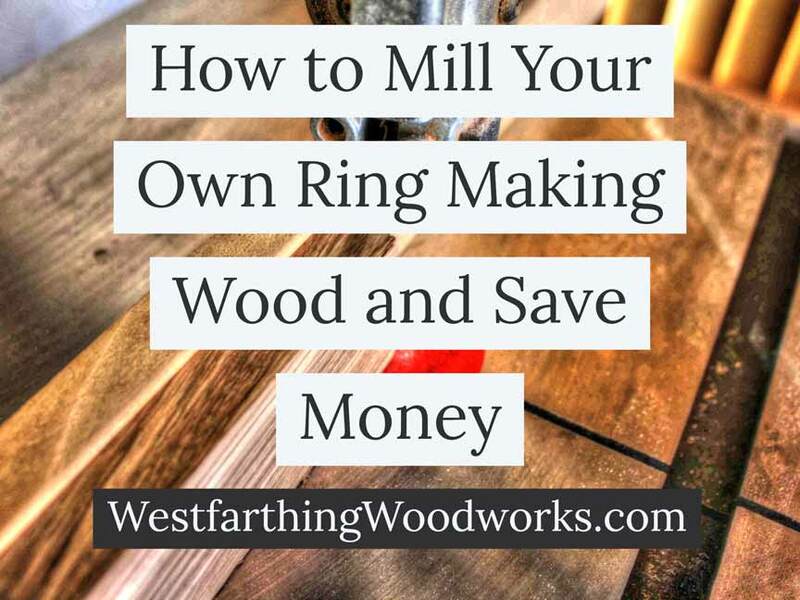 This is how to mill your own ring making wood and save money. 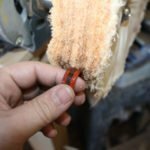 If you have access to a few common woodworking tools that you find in most shops, you can save a lot of money and make lots of thin stock for ring making. Here is how you do it. When you buy wood that is already thinned, you are paying a premium for the piece. This is because someone else had to use their tools to make the boards. Most milled lumber comes in standard thicknesses, and really thin pieces are not a standard. In order to create these pieces, sellers mill the standard wood into thin strips, and then sell them for more money. They know that some woodworkers do not have their own tools, so they make a little money by making the pieces usable for you. 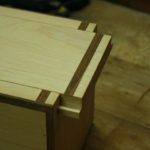 While this is a good thing for the beginner that has very few tools, if you do have a couple basic woodworking tools in your shop, you can save a ton of money and make the thin wood yourself. Most Wooden rings are made from a process called lamination. This is where several pieces of thin wood are sandwiched together, and then glued. From that blank, finger holes are drilled, and the rings are cut loose and shaped. You can see the process in my post on How to Make a Laminated Wood Ring. 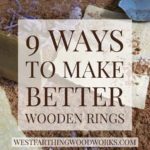 In order to participate in this kind of ring making, you need thin pieces of wood that range in thickness from one eighth of an inch to about half an inch. 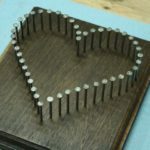 If you have a table saw or a band saw, you can make these yourself. If you have a thickness planer, or sander, you can also make the smoothing process much easier in the end too. Even if you have to hand sand them with a block, you will still save a ton of money over buying them already cut. 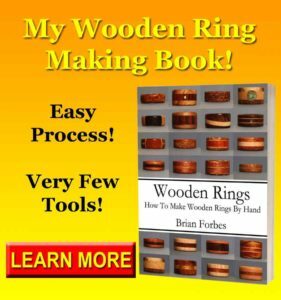 One of the easiest ways to get ring making wood is on the table saw. Simply set the fence for your desired thickness, and start sawing off thin sheets from any standard piece of lumber. As the sheets come off the saw, collect them for the next step. The sheets are going to have saw marks, and those need to go before you can glue them into stacks. If you do not do this part of the process, there will be gaps in your laminations that will be easy to see, and you will wish you sanded the strips. Sometimes, it’s the Last 10% That Makes the Difference. Simply sand or plane the strips until they are smooth on both faces. When you are done, the pieces are ready to use. The smooth faces will mean that you don’t have gaps in your glue up, and your rings will look better as a result. Lots of shops have band saws. These come in a ton of different sizes, and they are available at really inexpensive price points. If you have one of these saws in your shop, you can start using it to mill ring making wood. Simply set the fence so that the saw cuts pieces that are thin enough for making rings. Pass the wood billet through several times, making thin sheets from the larger piece. Collect them, and then proceed to sanding. The band saw will typically leave more scratches and tool marks behind than the table saw, so you will have to contend with that later. Make sure that you spend some time taking out those scratches. It will make a big difference in the final look of rings. 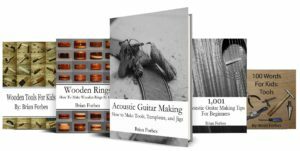 If you want to learn more about rings, 35 Important Tips on How to Make a Ring is a long read, and filled with great ring making tips. If you don’t have the tools to mill your own blanks yet, don’t worry. You can start saving and pick up a small table saw inexpensively. This one tool will help you split open your thicker pieces, and mill thin sheets for making wooden rings. To flatten them, attach a piece of belt sander belt to a flat piece of wood. Rub the slices against the sandpaper, and it will help you create a flat surface. This process takes a little time, but you will get good results. Take your time sanding. So many people quit too fast during the sanding process. They actually make it so close to the end, and then they quit. Don’t be like that, and keep sanding until it’s perfect. Alternatively, you can ask for help from a friend to make your thin pieces for rings. Odds are that you know at least one person that is into woodworking. In a case like this, you might be able to get their help and mill a few pieces to start. Friends love to help each other, and woodworkers love to talk about woodworking. A friend that can help you mill some blanks so a combination of both. Ask around, and see if you know someone that can help you, odds are you and find someone pretty easily. Finally, the process of milling is pretty quick. So, you would not be imposing on anyone for too long in order to get your blanks cut. This increases the chances that someone will give you a hand when you need it, because the time commitment is very low. Your homework is to start milling your own blanks, or at least look into what it will take to get you started. If you plan on making a lot of rings, you can lower your cost quite a bit by milling your own thin stock rather than buying it from a store. If you plan on selling your rings, the lower your cost, the better. Wood for making wooden rings is small anyway, but even a dollar saved is a dollar earned on a wooden ring. Look into the process, and see if you can pick up a small table saw from a home improvement store. Home improvement stores carry good saws for the average woodworker. These are actually pretty good, and I use a lot of their tools in my shop still to this day. My ten inch table saw was only a hundred dollars, and I have had it for close to fifteen years. Milling your own blanks presents a significant savings over buying the pieces already thinned. A piece of wood carries a cost that depends on the amount of time and tools that it took to make. When you buy wood in special thicknesses, you are paying more for time and tools that you don’t have. Instead, look into milling your own blanks. If you have a table saw or a band saw, you pretty much have what you need to make your own thin stock. Simply cut open the thicker pieces, making several thin sheets. Then, sand the tool marks off the sheets. If you don’t have the tools, look into saving for them and buying a smaller version from a home improvement store. 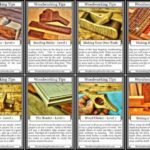 You could also think about visiting a friend that does woodworking to see if they can help you mill your first few pieces.